This PDF 1.5 document has been generated by PScript5.dll Version 5.2.2 / Acrobat Distiller 10.0.0 (Windows), and has been sent on pdf-archive.com on 25/09/2016 at 05:56, from IP address 36.73.x.x. The current document download page has been viewed 215 times. File size: 232 KB (7 pages). Program. Journal of Education and Learning. Vol. 10 (1) pp. 8-14.
environment can provide learners to simulate professional practices within the lesson and attributes. public mind, self-efficacy, and learning satisfaction are investigated. survive with friendly environments. The location of this community can be shown in figure 1. Prasart Nuangchalerm. (2016). 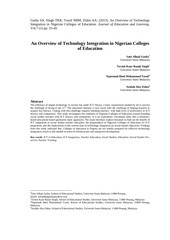 Journal of Education and Learning. Vol. 10 (1) pp. 8-14. Mostly, community members were Buddhist and sincerely appreciated in Buddhist philosophy. ceremony) which transmitted by the old generation to next generation. community. Instructional process can be explained into 3 phases: Preparation, Action, and Reflection. is not far from university. The qualitative information is collected by interviewing and observation. community preserve and transferred to new generation. some sectors temple, village, and school decided to keep herbal plants as useable knowledge. projects implemented. They are ready to do with group working and community in highest level. their self-efficacy which this study reported (table 2). that they have almost self-efficacy at high level. Some items are at medium level such as I am a friendcentered society, I can change others to new opinions, and I always admired by friends. process through learning satisfaction (table 3). suitable for community study, local knowledge transferring, and absorbing way of villagers’ life. connections, applying theory and essential skills, socializing to profession, and increasing selfawareness to diverse culture (Eyler &amp; Giles, 1999). by community (Aikenhead &amp; Michell, 2011). This approach of learning has become a popular trend in undergraduate learning activities. understanding of course content, appreciation of local knowledge, and enhancing sense of public mind. (Dixit &amp; Goyal, 2011; Seider, 2013). I thanks Mahasarakham University for financial support during the study. higher education. New York: Palgrave Macmillan. Butler, M. (2013). Learning from service-learning. PRIMUS, 23(10): 881-892. Campbell, E.M. (2012). 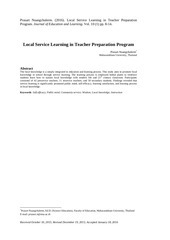 Implementing service learning into a graduate social work course: A step-bystep guide. Journal of Teaching in Social Work, 32(3): 300-313.
policies and practices, teacher quality and school development. Kentucky: Routledge. readiness: Developing a new paradigm. Education Policy Analysis Archives, 22(86): 1. Higher and Adult Education Series. Kolb, D.A. (1984). Experience as the source of learning and development. New Jersey: Prentice Hall. Nuangchalerm, P. (2014a). Learning science in the 21st century. Mahasarakham: Apichart Printing. practices. Chemistry: Bulgarian Journal of Science Education, 23(6): 815-828.
for pre-service teachers. Higher Education of Social Science, 4(3): 54-58. Baccalaureate Social Work Programs. Journal of Teaching in Social Work, 34(5): 480-495.
coursework. Journal of Computing in Higher Education. 1-8. This file has been shared by a user of PDF Archive. Document ID: 00486763.